PUNE: Bikes and scooters will soon boast of an inbuilt global positioning system (GPS) navigation, a feature restricted to only top-end car models. Pune-based Tork Motorcycles is looking to provide GPS navigation in it’s yet to be launched electric bikes, while TVS Motor has similar plans for some or all of its models in the motorcycle and scooter segment, industry sources told pune-news.com. "TVS is working on offering the GPS navigation feature in its two-wheeler products (bikes and or scooters). It is unclear when will they introduce these products. It could happen anytime within this fiscal or next," a source said, adding that navigation will be through a combination of voice and arrow directions. When contacted, TVS Motor executives declined to comment. 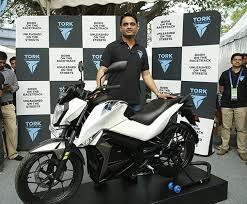 Tork Motorcycles, which is seeking pre-booking interest for its electric bikes, will have the GPS navigation feature when launched in the market, said its founder and CEO Kapil Shelke. On how will this feature work, Shelke said, "What happens is that the primary function (for a display unit in a two-wheeler) is speed versus all the other information. So when you need navigation, speed will shift (on the display) making way for navigation." "It will be a multi-utility display with changing screens to show different sets of information. We are currently experimenting with Google (Maps) application programme interface (API) for this feature. The idea is to make it as seamless as possible with what is being currently used by the masses for navigation purposes," he said. A homegrown brand, MapmyIndia, has been offering navigational service in India since 2004 with the claim that maps used in almost every car (Indian or international) that the navigational feature (in India) belongs to it, though the software for it may or may not be theirs. On advantages of using Google Maps over MapmyIndia, Shelke said, "We will be releasing a lot of updates especially about our charging network that will come across markets we'll be operating in. Google currently seems to be the best available option to give these updates and we can do a lot of other things with them," said Shelke, adding that his tech team is already working on a couple of transactions with Google. In terms of cost addition to the vehicles due to navigation feature, there will be a hardware cost with communication feature, 3G/ 4G SIM card slot etc. "In the case of Tork Motorcycles, this will be done via a TFT or LCD screen akin to a mobile handset. You will have a tablet-like display on the bike. And if one compares the cost versus benefits, I think the benefits are more in terms of usability, user interaction with the motorcycle and a host of other information that can be displayed on the motorcycle," said Shelke. 'There are various ways of building the cost into the system and we are still trying to figure out the best possible option," he said, adding that a lot of tests, related validations, internal tooling are being done currently to be able to improve the motorcycle for the launch, which has already got delayed by a year or so. In four-wheeler segment, industry sources said, the country's top car maker Maruti Suzuki is planning to offer GPS navigation as a standard feature across all or most of its cars (currently only the top end models have this feature) starting next year. "They (Maruti Suzuki) want to go big with this feature as another unique selling point for their cars in India," said the source. It is unclear though if Maruti Suzuki will go with Google Maps or MapmyIndia for this mass roll-out of GPS navigation across its car models in India. While Google and MapmyIndia could not be reached for a comment, in an email response to DNA Money, a Maruti Suzuki spokesperson said, "As a policy, we don't give guidance on future technologies. We will be happy to share details when we are ready."